I was on a recent flight from San Francisco to Seattle that took off just as the sun was about to sink below the horizon. From a window seat on the left side, I faced over the ocean to the west. 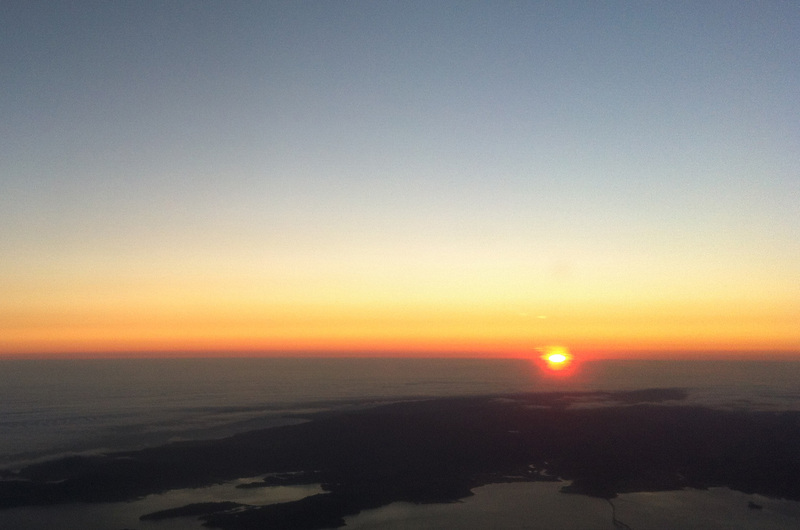 As the plane climbed, the setting sun actually began to rise further and further above the horizon. This occurred since our climbing into the sky allowed us to see further over the horizon. The sun rose from just the tip top showing, to about 40% above the ever-changing horizon line. So instead of disappearing quickly, it was nearly frozen (a challenging adjective to use for the sun) in that position for maybe 15 minutes, and then it ever so slowly finally set. For a while the scene was like the following picture, taken from the window from my phone – the actual sun was a lot sharper partly-below-the-horizon view. There is a reported green flash that can occur just after a sunset (or before a sunrise) if atmospheric conditions are just right. I hoped to see it – perhaps several times in this case – but whether due to clouds along the horizon or whatnot, it didn’t occur. More on that later. Curiously, on the flight I was reading the book The Light Between Oceans, a novel set around a lighthouse on an island southwest of Australia. As I watched the reverse sunset, I was reminded of this line in that book, about the perspective from up at the top of the lighthouse tower: “Because it’s this high above sea level, the light reaches over the curve of the earth – beyond the horizon.” One character notes the light is like “seeing into the future,” looking ahead to save a ship before it knows it needs help. For my case, it was like looking slightly into the past, pulling the sun back up above the horizon after it had nearly disappeared. That book features a live baby that washes up on the island, with a dead man on board the boat. This is not much of a spoiler because you learn this after about page two. It reminds me of a curiously similar plot point in CS Lewis’ Narnia book, The Horse and His Boy, in which (page 5 spoiler alert) a living baby washes ashore in a boat that also contains a dead man. In that case, the child had been sent off by someone trying to stop a prophecy that the boy would lead to a kingdom’s downfall. This attempt to block the prophecy was the necessary ingredient to make it come true. Which echoes, curiously enough, a theme in the previous book I had read, Terry Pratchett’s The Last Continent, which also took place on Australia. Well, as Australia-like as can occur in a ‘Discworld’ novel, complete with kangaroos. In this novel, the wizard Rincewind is selected to solve a particular problem, and such scenarios always mean pain for him. So he flees, as it turns out, in the proper direction to allow him to eventually save the day. In a sense. And suddenly there came a breeze from the east … It lasted only a second or so but what it brought them in that second none of those three children will ever forget. It brought both a smell and a sound, a musical sound. Edmund and Eustace would never talk about it afterwards. Lucy could only say, “It would break your heart.” Why,” said I, “was it so sad?” “Sad! No,” said Lucy. And back to that lighthouse book: As it turns out, the boat that serviced the lighthouse island was named Windward Spirit. Which is a bit curious since this turned out to be within one vowel of an almost appropriate title for the guy sitting next to me in the exit row of the plane; he leads an organization called Windword Ministries. He had just been doing some ministry work in Mexico and was heading back to B.C. via Seattle.